"How'd you get in there?" 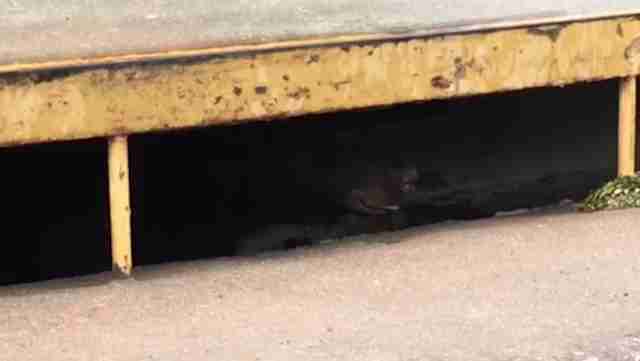 Folks at the Brookdale Skyline assisted living community in Colorado were given quite a shock on Thursday after residents there noticed someone unexpected lurking in a nearby storm drain. Peering out from the shadowy sewer — was a bear. How the rather large bear ended up there isn't clear, but it appeared he'd need a helping hand to escape the spot. Before a rescue plan was put in place, a crew from news station KRDO 13 dropped by to see the sewer bear firsthand. "How'd you get in there?" someone is heard asking the bear on a video from the scene. The bear, however, chose to stay mum. Fortunately, the bear's subterranean predicament had a pretty easy solution. Officials from Colorado Parks and Wildlife simply opened up the closest manhole cover and waited. It wasn't long before the bear climbed up and out on his own. With any luck, this will be the bear's one and only run-in with wildlife officials.